14:10hrs Arrival at the Tashkent Airport, Customs & Immigration will take about 1.5 Hrs. 10:00hrs Visit Charvak and Chimgan mountains. 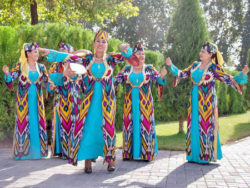 Nicknamed Switzerland of Uzbekistan, this area is famous with Tashkent residents and guests as a recreational area. Chair lift takes you to the top of the mountain from where you enjoy breathtaking views, you must take some time for photo shooting! 2 bottles of 0.5 ltr water per person per day IN COACH & HOTEL.